X-ray image of the central region of the galaxy NGC 4151. The Chandra image shows a massive cloud of hot gas in the center of NGC 4151. The brightest regions in the cloud correspond to wisps that were previously observed in visible light by the Hubble Space Telescope. The colors represent X-ray intensities, not temperatures, with white the most intense, then yellow, etc. The cloud is 3000 light years across. The gas is heated by X rays from gas very near a giant black hole in the center of the image. 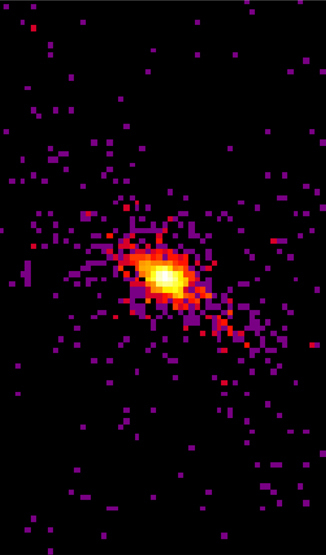 Observations using the high-energy spectrometer aboard Chandra show that the gas contains a variety of heavy elements such as nitrogen, oxygen, neon, magnesium, aluminum, silicon, and iron, and that portions of the cloud are moving away at a velocity of 800,000 mph. It is thought that this gas is being blown away from the far side of the black hole by the pressure of the radiation from the black hole. The elongated shape of the cloud confirms that X rays from the black hole are collimated into a narrow beam that illuminates only gas lying in certain quadrants of the galaxy. 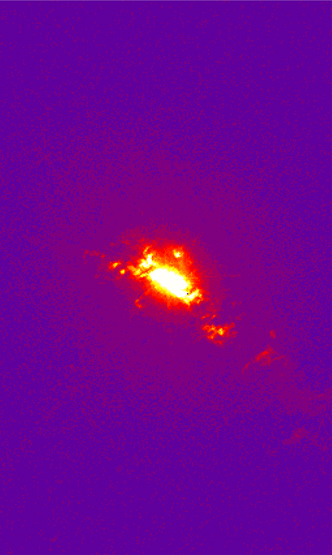 Scale Image is 27 x 45 arcsec across.